Bruker AXS, the global market leader in X-ray diffraction (XRD) instrumentation, introduced its D8 ENDEAVOR™ process diffraction solution for the analysis of polycrystalline material by means of X-ray powder diffraction at PITTCON 2015. 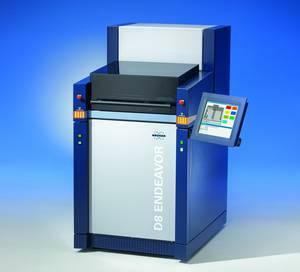 The new D8 ENDEAVOR is the successor to the well-established and market leading D4 ENDEAVOR™ process diffractometer. The new D8 ENDEAVOR pairs unprecedented accuracy, precision, and analysis speed with the superior hardware and software technology inherent to all members of the successful D8 family of Bruker AXS diffraction solutions. The D8 ENDEAVOR is equipped with the latest one-dimensional LYNXEYE XETM detector technology enabling shortest measurement times while maintaining best sensitivity for the detection of crystallographic phases with lowest concentrations. This exceptional feature of the D8 ENDEAVOR is the essential for powerful process and quality control in the aluminium, cement, geology, mining, pharmaceutical and pigment industries. The flexibility of the sample handling with the new D8 ENDEAVOR has been extended to guarantee highest adaptability and reliability: Conveyor belt or external robot interface for automated sample loading, continued measurements during manual loading of single samples or sample trays while measurements are executed, fast and robust internal sample handling, as well as a permanently kept horizontal sample position; all this is realised with the new design of the D8 ENDEAVOR. The new D8 ENDEAVOR is easy to operate in either standalone PC-based or in automation-integrated mode. On top, the optional and unique touchscreen interface simplifies measurement and data analysis for non-expert operation. Another crucial part of the diffraction solutions based on the new D8 ENDEAVOR is the software DIFFRAC.SUITETM and TOPASTM. The well-proven DIFFRAC.SUITE offers intuitive operation based on a graphical user interface that can be customised to match the operator’s requirements. The brand-new DIFFRAC.DQUANTTM plug-in provides enhanced conventional or legally mandatory quantification methods based on calibrations, while the unique TOPAS puts the D8 ENDEAVOR ahead of any other X-ray diffraction instrumentation. With TOPAS, the quantitative crystalline phase and micro-structure analysis can be executed accurately without any standard samples due to the unique implementation of the fundamental parameter approach. Dedicated application packages for cement, minerals, and metals and professional support by the global Bruker service network guarantee a fast ramp-up and highest up-time of the new D8 ENDEAVOR diffraction solution. Image: Bruker D8 ENDEAVOR™ process diffraction solution. Photo: courtesy of Bruker.